So far, I'm having a pretty pleasant day. The weather is very cool today, for the end of June in Minnesota. I'm not complaining though, because as much as I LOVE summer, I can live without the sweltering heat and humidity we've been having the last couple of weeks. Having just turned 51, (I guess I have to update my profile), I've begun having frequent hot flashes the past few months. They're much worse when the weather is hot too. I'm hoping to go see "My Sister's Keeper" and maybe have dinner with my hubby tonight, and then possibly meet up with Kathy for a birthday drink somewhere. I'll let you know how all that goes. 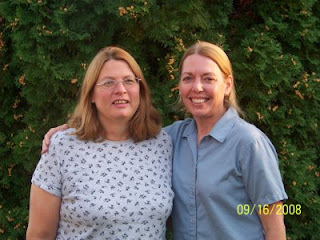 Happy Birthday, Bonnie and Kathy!! 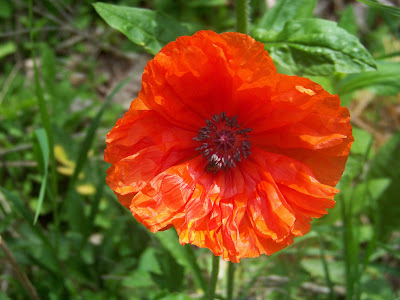 Wordless Wednesday #30 Wildly Beautiful! 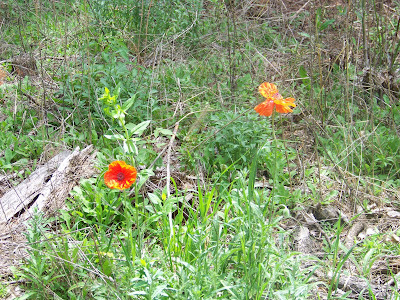 I don't know what kind of flowers these are, but found them growing wild between our backyard and the row of pine trees. Does anyone know what they are? 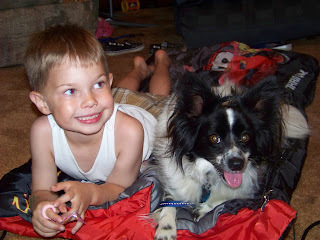 After the tragic loss of my grandson CJ's dog "Bart", all he could talk about was getting a NEW dog. His mother, Jessica searched on Craig's list for one that would be a good fit for our family. She wanted one that was not too big, not too small, one that loved children and was okay with not being the only dog in the house...and one that wasn't going to cost a whole lot of money. At last, the search is over. 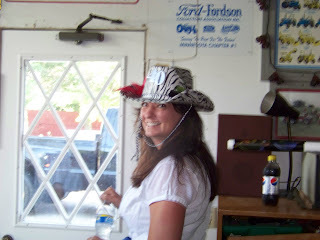 She and CJ and I went to go pick up "Finn" yesterday, while Molly was gone to Valley Fair with her youth group. We surprised Molly with him last night when we went to pick her up at church. 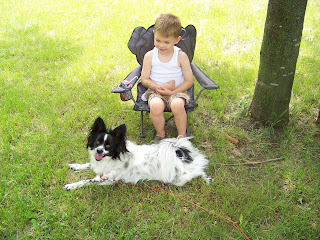 He's about 2 1/2 years old, and is a purebred Papillon. "Papillon" is the French word for butterfly, and these dogs are so named because with their ears erect, their faces have the look of one. They told us that he's actually on the large side of the scale for the breed, but that's okay. He's about the same size as Bart was...which makes him quite huggable for a 4 year old boy. Jessica was able to adopt him for FREE and his previous owners even threw in his bed, crate, toys...and a "Coach" collar. The couple that had him had two little girls, ages 5 and 3 and had just added a baby boy to the mix 4 weeks ago. They decided that with the new baby and all, they just didn't have time for Finn anymore, and they were pretty excited that his new owner was a rough and tumble 4 year old boy that would love to play and wrestle with him. So far, Finn seems to be a pretty good dog, and I have heard that as a breed they are very smart, good with children and are known to be "eager to please." We shall see. The thing that I do not like, is that he seems to have taken a liking to my bed. I am NOT really a dog person, I mean, I can tolerate them living in my house, I just don't want them in my bed! The worst thing was, he decided to jump up there right after his bath last night! Eeewwww, wet dog smell, not my favorite "oderant". I stripped the bed and washed everything. He's going to have to learn not to do that again, if him and I are going to get along. I'd just close my bedroom door...but it's hard to lock a curtain. Two Family Birthdays This Week! My step-daughter, Sarah turned 28 on Tuesday of this week. It's hard to imagine that I've known her now for 10 years! I watched her graduate from H. S., and then she was off to college...earning her L.P.N. and finally her R.N. 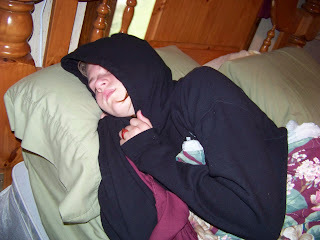 She married Brad a little over 4 years ago, and they live in northern Minnesota. 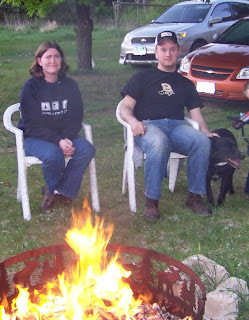 They are enjoying their life together with their dog Buster, and waiting on God's timing to be blessed with children. Happy Birthday, Sarah! The other one with a birthday this week, is my son Joel. He turned 26 yesterday. I was due to give birth to him on May 19th...but he was evidently not too eager to come into this world, and hung around for an extra 29 days! 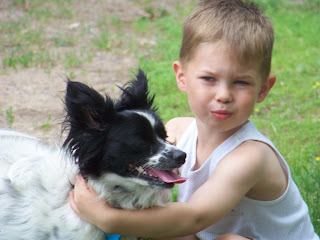 He was not my biggest baby...but he was close. He weighed in at 9 lbs .5 oz and was 22" long. He is now somewhere around 6'4" and probably weighs close to 200 lbs. He is living and working in a town just about 30 miles to the west of us. He's still single, but maybe one of these days he'll meet the right woman...and start working on a family too. Hey...I can dream, can't I? 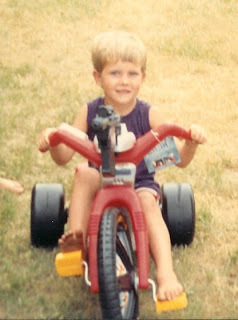 This is Joel on his 4th birthday, with his new Big Wheel. Do you think just maybe he looks a little bit like his nephew, CJ in this picture? 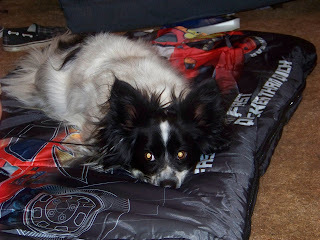 This is what he looks like in a more recent photograph. Happy 26th Birthday Joel! Depending on what time of the year it is, we either have 2 girls the same age and 2 boys the same age...or we have 4 of them in row. Now that these two have had their birthdays for the year, our childrens ages are 30, 28, 27, 26, 25, 21...and 12. 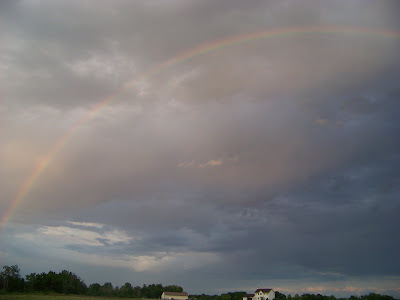 Wordless Wednesday #29 There'd be no Rainbows without the Rain! SISTERCHICKS in Wooden Shoes ~ Book Review and Giveaway! SISTERCHICK n: a friend who laughs with you till you cry and cries with you till you laugh; a gift from God. I have a few "sisterchicks" in my life, some of them being actual blood sisters, and others that are ascloseassisters to me. I have never personally had a pen-pal, but do have a few cyber friends, that I have subsequently met in person after getting to know them online. For that reason, I could totally relate to feeling like you've known someone for years, the first time you actually meet them face to face. In SISTERCHICKS in Wooden Shoes, "Summer" goes to the Netherlands to meet her longtime pen-pal, "Noelle" after getting some not-so-good test results from her doctor. Instead of waiting around for further test results, she plans to take some time out of her life to finally meet this friend from afar...just in case it's her last chance to do so. They have a wonderful, crazy time during their week together. I found this to be a fun book to read, it didn't take long, and there were some funny parts, as well as some rather emotional ones. 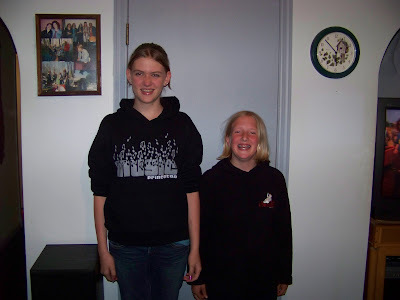 Wordless Wednesday # 28 ~ How Tall is a "Typical" American 12-year-old Girl? V.B.S. 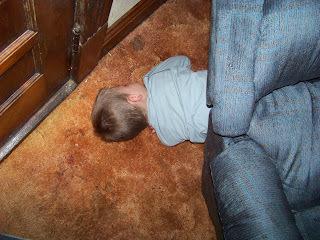 Takes Its Toll on Everyone! Today was the first day of Vacation Bible School at our church. This year's theme is "Studio Go Game Show." It will be every morning this week from 9AM to 12:15. My grandson, CJ is attending with a lot of his friends. I'm helping out with the babies in the nursery, with my good friend Lisa, (QTpies7), and Molly is helping out by leading the worship etc with some other older girls. So far, so good. There were over 100 kids there this morning, not counting the 6th and 7th graders that were there helping out! Everyone is having a great time, despite the rainy start to the week today. Molly had decided to take over my bed. I guess I'll call her "Goldilocks" from now on. I tried to get her out, but there was no budging her. It is now after 5:30 and they are both still asleep! 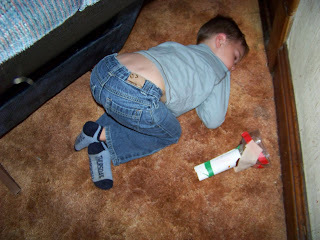 I'd better go wake them up, so they don't stay up half the night tonight and repeat this behavior tomorrow!! Why Yes, It Actually IS Rocket Science! At least, it's middle school "rocket science". Molly was studying rockets in her 6th grade science class, and they sent home a form for us parents to order rocket kits for them to launch at school. The options were: a) buy a kit that could only be launched once, b) upgrade to the more expensive one that had a launch pad and 3 extra engines, or c) choose not to buy one at all, and have your child paired with another student that has one. I left the decision up to Ray, and being just a big kid at heart...he chose option b, so that he could play with it at home. But the funniest thing happened AFTER I thought it WASN'T recording... If you listen closely, you can hear Christian say, "Whoa! Molly's rocketship goes that far?!" Jessica tells him, "Yep." If you can't understand his next comment, my grandson says, "That's a little SCARY!" And then I start giggling. It's a good thing I decided to watch it on my computer, because I realized I actually DID get the rocket coming back down with the parachute...and I had also forgotten all about Christian's comment at the end. We get to launch it two more times now...yay! I just drew the winner for the book "Dear Mom". And it is...Nicole D! I also need to apologize for not getting the last couple of giveaway books out in a timely manner. They are sitting in my entry way, ready to go...but with not having a vehicle for the past five months...it gets difficult to get them to the post office. I'm so, so sorry! I NEED to remember to send them with my dh tomorrow!!! I will send an email out to Nicole, and if I can get her mailing address yet today, I can send her book along with the rest. 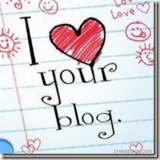 Look for my next book giveaway right here, next week! 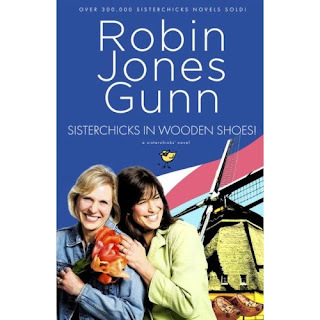 It's called "Sisterchicks in Wooden Shoes" by Robin Jones Gunn.